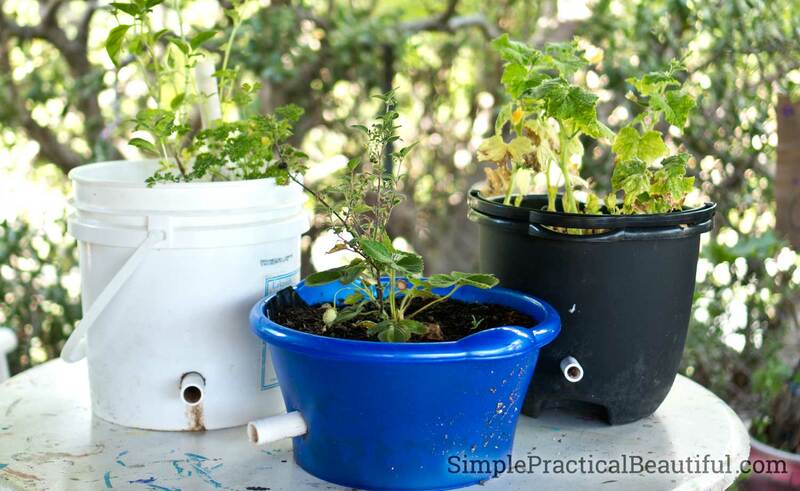 Make a self-watering planter or wicking-bucket to keep your plants healthy and well-watered. Perfect for a patio garden or any yard. I learned how to make a self-watering container in a class taught by a San Diego Master Gardener, and I am so excited to share what I learned with you because it’s a genius idea. It’s an easy project using supplies you probably already have around your house and yard. And it will keep your plants healthy and thriving. I am an inconsistent gardener. I love gardening, but I will forget about my plants for days or weeks at a time. I can’t tell you how many plants I’ve killed because I forgot to water them regularly. It’s why we installed an irrigation timer, a drip system, and a sprinkler system in our backyard. But those are expensive, and they don’t work very well for pots and small planters. 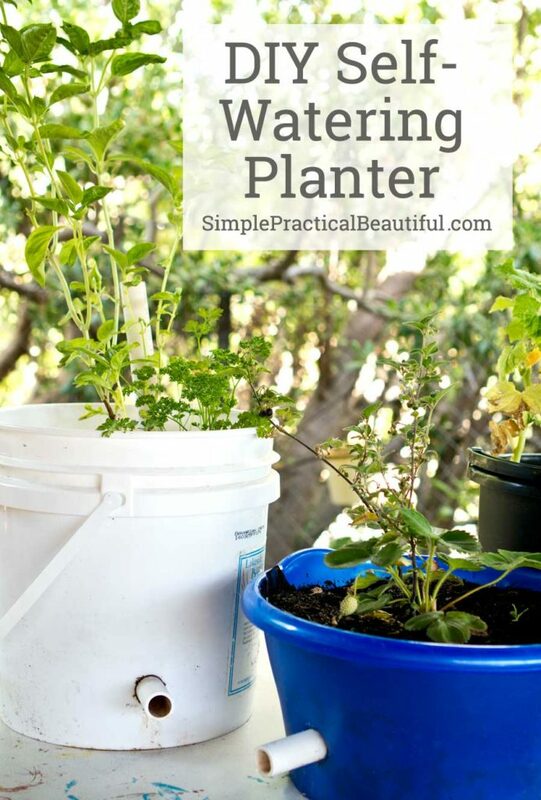 A self-watering planter is inexpensive and keeps plants watered for days or even weeks without over-watering them. I’ve made three self-watering buckets so far; you’ll see them all at the end of the video. And all three have plants that are thriving. This list includes affiliated links for your convenience. For more information, please read my full disclosure policy. Our San Diego Master Gardeners are wonderful. I’ve learned so many things from them, beyond how to make this self-watering planter. They offer free gardening advice, classes, and more. And it’s specific to gardens in my area. If you live in the San Diego area, check out their website: mastergardenersd.org. If you live somewhere else, find your local Master Gardeners through your county or local university. Master Gardeners are the best help for your garden. When you make your self-watering container, I’d love to see a picture. You can post it on my Facebook page or add it to a comment below. Happy Gardening! When I read the title, I thought you were doing some innovation involving automated drip system but this turned out to be such a pleasant surprise! With out buying expensive and state of the art equipment and tools, you have created such an effective system! I am surely going to try this out. Thanks, Ron. It is a really simple, but effective system. And it was nice that I already had all the parts.